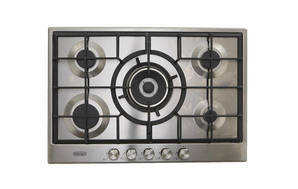 Snapshot: The DeLonghi DEGHSL75 gas cooktop has 5 burners and flame-failure protection. How well does it cook? Very good burner layout (wok burner at centre, large and simmer burners at the front).